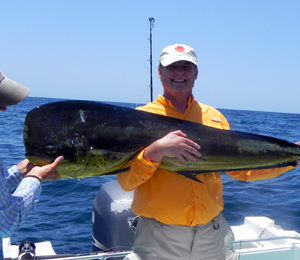 If big game fishing is your game, the fishing in Cabo should be your aim. Cabo San Lucas is world renown as one of the premier fishing destinations on Earth. Just off the coast of the city, teems a bustling ecosystem filled with many different kinds of fish. In the city, some of the best fishermen on the planet live, work, and play, trolling the Pacific Ocean for the catch of the day. The city is also home to one of the most prestigious fishing tournaments in the world. Whether you're a sportsman, outdoorsman, or looking for a day trip to cast a line, Cabo fishing is one of the things you need to do before you leave Mexico. Right off the city's coast lies some of the most fertile waters on the planet. We here at Cabo Fishing Fleet would love to help you take advantage of the perfect conditions for fishing in Cabo. At Cabo Fishing Fleet, we offer Cabo deep sea fishing, light tackle fishing, and fly fishing to accommodate anglers of every age, interest, and skill level. Whether you're angling for tuna or marlin, shark or dolphin, our professional fishermen and expert instructors will help you make your experience fishing in Cabo active, fun, and fruitful. If you want to land the catch of the day, deep sea fishing is probably your best bet. Want to get out on a boat and into the sun? Try us out for fly fishing or light tackle. However, when fishing in Cabo, don't be surprised if even these adventures land you a big catch while you're relaxing on a boat. There is a simple reason why we are called Cabo Fishing Fleet. We have a lot of boats. If you need a small boat for some light tackle fishing in Cabo or a larger vessel for big game Cabo fishing, we have the right boats at the right prices to make any vacation a fisherman's delight. But fishing in Cabo just wouldn't be as fun without having the tools to help you make the most of the experience. At Cabo Fishing Fleet, we employ star instructors to help you make every trip onto the water as successful as it can be. The lessons you will learn from our professional fishing instructors will hold information that you will be able to use on any fishing trip you take for the rest of your life. There is really no better way to learn fishing than by learning fishing in Cabo. At Cabo Fishing Fleet, we take fishing seriously, and so will you after an excursion with us.